﻿ QRide Mackay Learn 2 Ride motorcycle training Pre Learner RE and R licence course. Bikes supplied . Learn to Ride and do your Q Ride Mackay with LEARN 2 RIDE your local motorcycle training school. Choosing to Q ride with Brett Hoskin at Learn2ride will be one of the best choices you make in your motorcycle riding career. Our 1 on 1 pre Q ride lessons and Q Ride training and licence assessment program suit both males and females of any age and are designed and delivered in a way to get results fast and safely. Q ride training and license assessments. Pre Learner ,RE and Open R Motorbike License. Novice motorbike riders with some motorcycling experience. Recreational dirt bike riders wanting to learn road craft and road safety. Riders returning to motorcycle riding after a layoff period. Advanced motorbike rider training for riders wanting to enhance their current skill level. Scooter and Moped roadcraft courses. QRide in Mackay Motorcycle Training & Learn to Ride with Brett Hoskin and the Mackay Region's Premier Local QRide Motorcycle School. We don’t settle for second best and neither should you. Brett is your local Qride motorcycle licence trainer serving the Mackay region since 2007. Support Local business and Qride with someone who you can trust . 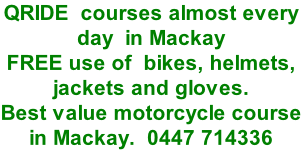 Learn2ride Qride Mackay motorcycle Training wants you to be the best and safest rider you can be. 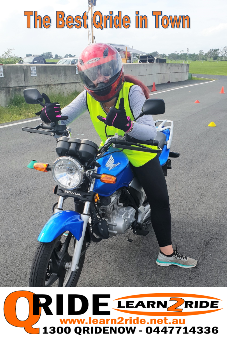 Learning to ride a motorcycle is a wonderful experience and the Learn2ride Qride motorcycle training and licence program is the best way to get your motorcycle license in Mackay and up on 2 wheels smoothly and safely. We can supply you with helmet, jacket gloves and motorbike for you to use during your 1 on 1 riding lessons or Qride license course in Mackay. View your time with us as an experience during which you will learn riding skills and techniques that you may not have learnt on your own. Chances are you have seen Brett on his bike around Mackay on his big Honda accompanying his Q Ride students.